The gruelling multi-stage rally was previously held in Africa but was relocated because of safety concerns in Mauritania in 2008. Saudi Arabia can offer 1.4 million square miles of desert for the route. Reports suggest the rally will be held in Saudi Arabia for at least five years. "After 30 years of discovering the beauty of Africa and a decade of adventure exploring the spectacular landscape of South America, a new chapter in the history of Dakar will be written," the organisers said in a statement. 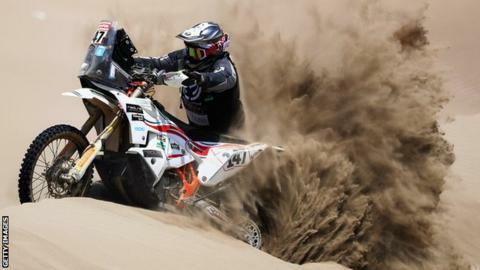 This year's event - held in Peru - was the 41st, with 180 riders, drivers and crews completing the 10 stages in various vehicles. Motorcyclist Sam Sunderland was the first Briton to win the rally in 2017.